I grew up around the sport of windsurfing. My parents were both competitive racers that consistently raced out of Crissy Field in StFYC sponsored events and some national races as well. My dad picked up kitesurfing in 2006. I was about 5 years old at the time, and I found it very exciting to watch. My mom was still windsurfing. When I was big enough to learn either, I chose kiting. I took lessons and fell in love with the sport. I got into racing course boards in the fall of 2013. 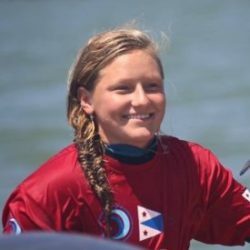 Since then, I’ve switched to foiling, and in 2015 was ranked 2nd in women’s overall in the world tour (right behind my idol and training partner Erika Heineken). I was also top 5 in under 18 and under 21. In 2014, I became a junior member of the StFYC. 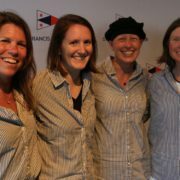 In 2015, support from the St Francis Sailing Foundation allowed me to compete in my first international event. I am working towards competing in the 2020 Tokyo summer Olympics for kiting. 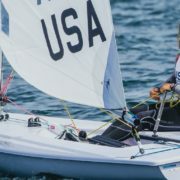 In the next season, I plan to sail clean and to compete in as many international competitions as my school schedule will allow. I am looking forward to representing the StFYC and StFSF in future local, national, and international events. Now, I am almost 15 years old and a freshman Campolindo High School in Moraga, California.